Published by the Canadian Centre for Policy Alternatives (CCPA) and the Rideau Institute, Ottawa, February 2016. Full report available as pdf. Over the past decade, Canada and the Canadian Armed Forces (CAF) have experienced a major decline in training and education for peacekeeping operations (PKOs), also known as peace support operations (PSOs) or simply peace operations. This development occurred in parallel with a major decline in Canadian military contributions to such operations. While Canada deployed large numbers of forces and provided key leadership for a half-century, it has deployed very low levels of personnel in UN peacekeeping over the past ten years. When the United Nations increased its forces to an all-time high in 2015 (over 90,000 military personnel), the Canadian contribution remained at an all-time low (less than 30 military personnel). This lack of participation and experience means that renewed training will be necessary if the CAF personnel are called upon to serve or lead in UN operations in the future. The complexities of modern peace operations require in-depth training and education, on subjects including the procedures, capabilities and limitations of the United Nations. Canada is currently far behind other nations in its readiness to support the United Nations and train for modern peacekeeping. This study focuses on the training and education of Canadian military personnel, particularly the officer corps; these officers could be expected to hold important positions in future peacekeeping deployments when the country reengages. These men and women in uniform can serve in both command and staff positions, including conceivably as a Force Commander— a position held by Canadian soldiers four times in the 1990s, but not since. A thorough review of contemporary training shows that the CAF provides less than a quarter of the peacekeeping training activities that it did a decade ago. Significantly, in exercises and simulations, Canadian officers no longer take on roles of UN peacekeepers as they once did. At CAF training institutions, courses and simulated exercises now focus primarily on the requirements of taking part in “alliance” or NATO-style operations, resulting in significantly fewer opportunities for officers to view missions from a UN perspective or gain understanding of UN procedures and practices. The 2006–11 combat mission in Kandahar, Afghanistan, certainly gave CAF personnel valuable experience in combat and counter-insurgency (COIN) operations. While there are similarities between these types of missions and international peace operations, there are also fundamental differences in the training, preparation and practice of peacekeeping deployments. War-fighting and COIN are enemy-centric, usually non-consensual missions that primarily involve offensive tactics, whereas peacekeeping is based on a trinity of alternative principles: consent of main conflicting parties, impartiality and the defensive use of force. A major change in mentality and approach, as well as knowledge, would be needed to properly prepare Canadian Forces for future peace operations. Special skills, separate from those learned in Afghanistan and warfare training, would need to be (re) learned, including skills in negotiation, conflict management and resolution, as well as an understanding of UN procedures and past peacekeeping missions. Particularly important is learning effective cooperation with the non-military components of modern peacekeeping operations, including police, civil affairs personnel and humanitarians, as well as UN agencies, non-governmental organizations (NGOs) and the local actors engaged in building a viable peace. The decline in peacekeeping training and education in the CAF is readily apparent when looking at the primary training institutions that prepare Canadian officers for service. This study looks at the Royal Military College, the Canadian Army Command and Staff College, the Canadian Forces College, the Royal Military College Saint-Jean, the Peace Support Training Centre and the now defunct Pearson Peacekeeping Centre. Since the activities of the Royal Canadian Air Force (RCAF) and Royal Canadian Navy (RCN) are quite similar in UN peacekeeping to other operations, this review concentrates on the army and joint training, from officer cadets to generals. To its credit, the Royal Military College, which teaches both officer cadets and graduate students, has managed to maintain roughly the same level of peacekeeping courses over the past decade, though it no longer co-sponsors peacekeeping summer institutes. The Canadian Army Command and Staff College, which provides the Army Operations Course (AOC) to soldiers of the Captain rank, currently provides much less preparation for involvement in UN peace operations than it did. The AOC no longer offers lectures on PSOs and the United Nations, as it did a decade ago. While there is a PSO aspect in one of the major exercises, the officers do not role-play peacekeepers but are instead part of a NATO-like operation. The Canadian Forces College in Toronto provides joint training/education for officers from the army, air force and navy. Its programmes are for the future leaders in the officer corps in Canada and selected other nations. Its activities (lectures and exercises) relating to PKOs have been reduced to less than half of what they were in 2005. The Joint Command and Staff Programme went from seven lectures and two discussions on peacekeeping in 2005 to two lectures in 2014/15, one of which is only given to one stream (roughly one third of the students). At the higher (national security) level, the case studies and exercises on peacekeeping were dropped. However, the higher-ranked students (mostly Colonels and navy Captains) continue to make a useful trip to New York City for lectures from UN and diplomatic leaders. The CFC once had an exercise where students actually role-played peacekeepers planning an operation: Unified Enforcer ran from 2002 to 2008 under the Advanced Military Studies Programme. Some current exercises play an alliance that provides offensive military capability to back a PSO but, as with the AOC, the role-playing is for NATO-like structures and not the United Nations. The Peace Support Training Centre in Kingston was established in 1996 to focus on peace support operations but over the last decade it has lost that focus. Under the demands of the Afghanistan operation, it refocused on training and preparation for NATO-style interventions. With the exception of the “peace support operator course” (formerly UN military observer and liaison course), it does not offer any UN-specific content among its eight courses. Finally, and most significantly, the Pearson Peacekeeping Centre, which used to provide cutting-edge peacekeeping education to over 150 Canadian military personnel a year, and to many more foreign national officers, was shut down in December 2013 following the loss of federal funding. With that closure, Canada lost its main peacekeeping facility to train military personnel, police and civilians together. When these programmes are taken in overview, the number of activities devoted to the United Nations and to peace support is far less than what it was a decade or more ago. The level of peace support training has declined to levels seen prior to the 1992–93 Somalia operation, which resulted in an extensive Inquiry which in 1997 recommended a substantial upgrade to the peacekeeping training regimen. Training and preparedness are core elements of the mandate of the Canadian Armed Forces. The men and women of the military seek to be constantly ready for any number of operational demands that the Canadian government and people may require of them. Especially with the Liberal government’s policy of re-engagement in UN peacekeeping,1 the CAF needs to increase the level of preparedness and training for peace operations if it is to be ready to serve in peace operations. Canadian soldiers have served as superb peacekeepers in the past and can do so again, with some preparation. To this end, this report recommends the reinstatement and updating of the many training programmes and exercises that have been cut, as well as the introduction of new training activities to reflect the increasing complexity of modern peace operations. Only through such a significant increase in training can Canadian personnel be truly prepared for peace. UN peacekeeping operations are now increasingly complex and multi-dimensional, going beyond monitoring a ceasefire to actually bringing failed States back to life, often after decades of conflict. Since Canada’s disengagement with UN peace operations more than a decade ago, the complexity, scope and requirements of peacekeeping missions have increased drastically. United Nations peacekeeping forces operating in the contemporary context must contend with raging conflicts, ethnic cleansing, human rights violations, factional infighting and spoilers of the peace process, as well as threats to themselves and their mission. Peacekeepers must not only protect local populations but also get the conflicting parties to the negotiating table, a task that requires different skills and finesse from those required for combat. Modern peace missions must also engage in important tasks that are outside strictly military operations: economic and social reconstruction (i.e., peacebuilding); election of transitional governments and the implementation of transitional justice; assistance to secure law and order; and a host of other tasks in addition to the traditional task of negotiating and monitoring ceasefires and peace agreements. To be effective in modern operations, peacekeepers need to know about a myriad of procedures within UN’s Departments of Peacekeeping Operations (DPKO) and Field Service (DFS) and the complicated UN family of agencies and non-governmental organizations working as partners in the field. The major functions of modern peace operations are illustrated in Figure 1, using terminology from UN, NATO and Canadian doctrine. At different stages of a conflict, the goals and roles change, though virtually all the listed tasks and activities are needed in all stages, to a greater or lesser degree. As the conflict first becomes inflamed, the main UN goal is the prevention of escalation, which requires early warning tools and pre-emptive action. “Peacemaking,” in UN and NATO doctrine, is the main tool here: the negotiation of a ceasefire or peace agreement. However, if this fails and the conflict becomes full-fledged, the UN must engage mostly in mitigation, using humanitarian relief to save lives and, in the most severe cases, peace enforcement against recalcitrant parties who are committing atrocities. As the conflict winds down and the termination phase is achieved through conflict weariness and/or diplomatic intervention, a ceasefire can be agreed upon. At this point traditional peacekeeping can play a major role in maintaining the ceasefire and a potential peace agreement, sometimes by creating buffer zones or physical space between conflicting groups. In the recovery stages, the United Nations must engage in peacebuilding to develop the infrastructure, social as well as physical, that will ensure a sustainable peace and a growing economy. This period also necessitates reconciliation between the former belligerents, which can take the form of Truth and Reconciliation Commissions, tribunals, or referrals to the International Criminal Court. As Figure 1 indicates, the operational demands placed upon the modern peacekeeper are far greater than the requirements typical during Cold War–era peacekeeping missions. “Traditional peacekeeping” primarily involved a small force interposed between two belligerents, or unarmed monitors covering a ceasefire or demilitarized zone, the Canadian Peace Support Operations Joint Doctrine Manual correctly noted in 2002. Not only is UN peacekeeping more complex; it has become much larger. The United Nations deploys over 100,000 uniformed personnel (military and police) in field operations, more than any other body, including the US government after the drawdown in Afghanistan and Iraq. 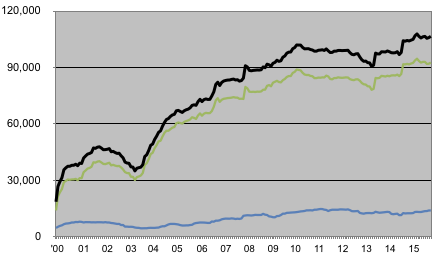 The graph of deployed UN peacekeepers is shown in Figure 2. The civilians deployed in UN PKO number about 20,000, so at present the UN deploys about 125,000 UN personnel in peacekeeping. About 120 countries contribute to peacekeeping, so any Canadian peacekeepers have to work with a large range of partners of varying skill sets. The number of field operations being conducted has dramatically increased as well. With the recent deployment in the Central African Republic, there are currently 16 UN peacekeeping operations being conducted across four continents. The mandates of modern peace operations are growing increasingly robust. The Force Intervention Brigade deployed to the Eastern Congo in 2013 received the first UN Security Council mandate for “offensive operations” against rebel groups. There are strong indications that, in the post-Afghanistan period, the burden of addressing emerging international crises is increasingly shifted towards the United Nations, with NATO limiting its intervention primarily to air strikes such as those used in Libya in 2011. While the number of personnel deployed in the field by the United Nations is now at an all-time high (see Figure 2), the Canadian Armed Forces’ contribution (shown in Figure 3) has stayed at an all-time low: 28 military personnel in UN missions (as of 30 November 2015). In its military contributions, Canada is ranked well below countries such as Tunisia and Mongolia and any of the permanent members of the Security Council. Canada’s primary contribution of personnel to international peacekeeping is now mainly in the form of the police officers (85 in number, almost three times the number of military personnel). These police officers are currently concentrated in the UN’s Haiti mission. 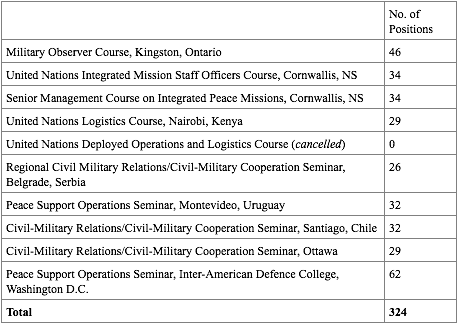 Even including these police contributions, however, Canada ranks 66th of 121 UN member states contributing uniformed personnel. As shown in Figure 3, the CAF contributions declined considerably in March 2006, as the newly elected Conservative government closed out Canada’s task force in the Golan Heights, Syria. This task force had played a major logistics role in the UN Disengagement Observer Force (UNDOF) since the mission’s creation in1974. Canada also provided the Force Commander for UNDOF in 1998-2000, the last time the country was given military command of a UN mission. By contrast, Canadian police forces (mostly RCMP) have provided the Police Commissioner in the UN Stabilization Mission in Haiti (MINUSTAH) for almost the entire time since the mission’s creation in 2004. If Canada is to deploy military personnel to UN operations or provide leaders (commanders) in coming years, and lead an international peacekeeping training initiative (all promises of the new Liberal government10), the training requirements for Canadian personnel will be even greater than they were in the 1990s. Unfortunately, as we shall see in the next section, training mechanisms and institutions involved in peacekeeping have been steadily eroding since the turn of the century, especially over the last decade, to the extent that Canada is in danger of becoming fundamentally unable to field adequately trained peacekeepers. General-purpose combat training is important but not sufficient (see “Myth 2” below). The Trudeau government seeks to “renew Canada’s commitment to United Nations peace operations.”11 In his mandate letter to the Defence Minister, Prime Minister Trudeau included the tasking of “providing well-trained personnel to international initiatives that can be quickly deployed, such as mission commanders, staff officers, and headquarters units; and leading an international effort to improve and expand the training of military and civilian personnel deployed on peace operations.” In order to understand how this can be achieved, we must look back at how training has changed in the main CAF institutions and stages over the last decade. The Canadian Armed Forces, like most militaries, expends a great deal of effort on training and education. It is a continuous process and different institutions are designated to provide courses, exercises, seminars, etc., to different rank-levels. 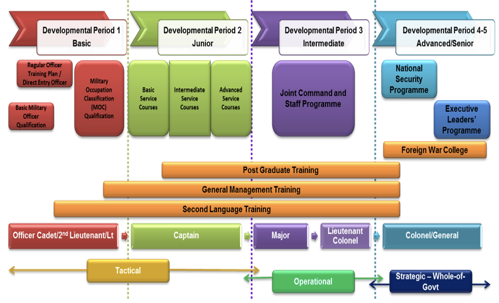 For officers (commissioned members), the system, shown in Figure 4, is broken down into five developmental periods (DP), progressing from officer cadet to general and flag officer. Department of National Defence, DAOD 5031– Canadian Forces Professional Development, 2003. The Royal Military College of Canada is the only degree-granting federal university. Located in Kingston, Ontario, it prepares candidates for service in the Canadian officer corps. Though primarily oriented towards educating Officer Cadets in the 1st Developmental Period (DP1), the RMC also provides undergraduate and graduate programmes of study for other members of the Forces and for civilian students. RMC is one of the few Canadian military institutions that has not seen its peacekeeping content decline since the early 2000s. All of the courses from 2001/2002 relating to UN peacekeeping continued in the 2014/2015 academic year (see Annex 1). There has been some re-naming of courses: an undergraduate political science course POE410 changed its name from “Advanced Studies in the Evolution and Theory of International Peacekeeping” to “International Conflict Management.” The two-credit War Studies course “International Peacekeeping” (WS508) was broken into two one-credit courses: “Evolution and Theory of International Peacekeeping” (WS509) and “Contemporary Peace and Stabilization Operations” (WS511). But, based on the course descriptions, there has been little change in the peacekeeping coverage of these courses. The peacekeeping summer training institute that RMC co-sponsored has been cancelled. RMC had entered a partnership with the Pearson Peacekeeping Centre (PPC) and Acadia University to sponsor a rigorous graduate-level credit and certificate programme in peacekeeping/peace operations in 2001-2004, through the jointly administered International Peacekeeping Summer Institute (IPSI) and then the Peacekeeping Operations Summer Institute (POSI). The institutes were held at the locations of the main partners: 2001 (Acadia), 2002 (PPC), and 2004 (RMC) for credit. Across the water (Cataraqui river mouth) from RMC in Kingston is the Canadian Army Command and Staff College, located at Fort Frontenac, informally called “Foxhole U.” It is for officers who have substantial experience after graduating from RMC. Soldiers of various ranks (second lieutenants, lieutenants, captains and majors) undergo training and education at the CACSC through the Army Junior Staff Qualification, the Army Operations Course (AOC), and the Command Team Course. The AOC is the main course, now consisting of seven weeks of distance learning (DL) followed later by 3-4 months in residence.13 In the DL part, PSO-specific material is currently found in the section on “Canadian Army Doctrine of Stability Operations,” mostly in the student-led tutorial exercise on “Stability Operations and Influence Activities.” The exercise has two parts and is conducted in sub-syndicate, “with one group working in a COIN context and the other working in a Peace Support Ops context.” Thus only half the students in the course get two hours of PSO material during the DL portion of course. The other PSO-specific learning comes in the exercises held in Kingston. In Exercise METRO ASSAULT officers plan an urban offensive and then seek to create conditions needed for a handover to a stability operation. In Brigade Ex METRO GUERRIER, they also plan and execute an offensive urban operation, followed by planning for stability operations. The plan envisions that Canadian elements will remain to conduct a PSO before turning over to a UN force. So officers gain an awareness of stability functions and a general idea of the UN role, but they do not play the role of UN peacekeepers. In Exercise MAPLE SHORE,14 soldiers simulate a counter-insurgency operation (COIN) in a fictitious country called “Isle” (based on a map of Haiti). The overall mission is led by the United Kingdom under UN Security Council authorization. The task force, under US command, is mandated to “create and maintain a safe and secure environment in WI [West Isle] within which HA [Humanitarian Assistance] can be distributed, and which will allow the development of government institutions and the promotion of economic well-being and human rights.” The tasks include “defeat” of factions, disarmament of all factions opposed to WI government, the provision of humanitarian aid and counter-IED measures. It is very Afghanistan-like in mandate and method, though not in geography. Exercise FINAL DRIVE is designed to cover the “full spectrum” of operations. Students initially plan for a ceasefire and a stability operation (including establishing a zone of exclusion and separation and demilitarization, and supporting the return of refugees and detainees and PWs [prisoners of war]. They also plan infrastructure projects. They plan and conduct combat operations and concurrently plan for the transition back to a stability op. In planning both combat and stability operations, the student must consider key stakeholders, including the host nation, the United Nations, NGOs, and the various ethnic groups that comprise the human terrain. Again the emphasis is on the transition between combat and stability operations, not on conducting a UN operation. In 2005, there was a lecture devoted to the United Nations and Peace Support Operations. Currently there is no lecture dealing with the topic, though mention is made of PSOs during other lectures. In the exercise emphasizing combat and COIN over PSOs, there is considerably less material currently devoted specifically to the UN operations. The Civil-Military Seminar, held over two days, does not cover the UN or PSOs but has included briefs on a number of relevant themes, such as NGOs in disaster management, Plan Canada, Global Medic, Adventist Development and Relief Agency (ADRA), World Vision, 1st Canadian Division, civil-military cooperation (CIMIC), Haiti hurricane path / vegetation map, the Disaster Assistance Response Team (DART), and the UK Comprehensive Approach. Selected army officers, after being promoted to Major or Lieutenant Colonel, may get the chance to further their education by joining officers from the Navy and Air Force at the Canadian Forces College in Toronto. At the DP3 level, selected Majors and Lieutenant Colonels (Navy Commanders) take the Joint Command and Staff Programme (JCSP) from the Canadian Forces College, either in residence or by distance learning. The JCSP programme was introduced in 2005 to replace the Command and Staff Course (CSC). With this shift came a significant loss in PSO material, including the only exercise of a strictly peacekeeping nature. Annex 2 shows the course changes over time. For coursework relating to PSOs, in 2001/2002, students taking courses at the CFC had 8 lectures, 1 discussion group, and 1 seminar, amounting to around 15 hours of contact time. By comparison, the last JSCP (serial 41, 2014/15) offered only one lecture to the entire course on the United Nations and none on peacekeeping. In one of the three distinct streams, there was a lecture on “The Evolution of Peace and Stability Operations” but it was only available to about one third of the JSCP residential students. In 2015/16 the programme (JSCP 42) offers an elective (“complementary studies”) course on “Peace and Stability Operations: An Evolving Practice.” This course is only offered to a small number of students (15), given that it is only one of nine or so electives on offer. The National Security Programme (NSP) is designed for Colonels and occasionally recently promoted Brigadiers, as well as executive-level civilians in the Canadian public service. The officers are the future military leaders of Canada and other nations. Despite the strategic level and international flavour of the programme, under the current training regime these officers receive only a single lecture-discussion at CFC on the United Nations.15 However, they visit New York for 2-3 days in an Experiential Learning Visit (ELV). This gives them good exposure to the United Nations officials and national diplomats, though they do not have meetings inside UN buildings but only at Canada’s Permanent Mission. A listing of UN and PSO related activities for current and past NSP serials is provided in Annex 3. A decade ago, DP-4 officers took part in two distinct, now replaced, course programmes: the Advanced Military Security Course (AMSC) of three-month duration and the National Security Studies Course (NSSC) of six-month duration. (The current NSP is of nine months’ duration, a kind of combination of the two earlier courses.) In NSSC 7 (2005) there were many more activities on the UN and PSOs: a lecture discussion (“Canada and the United Nations,” held in NYC), a lecture (“International Organizations”) and a Case Study (“Op Assurance – Zaire”). The AMSC had a “PSO Symposium” of 1.5 days but this was last held in 2005. It included lectures, seminars and discussions on issues like “Conflict Termination and Resolution” and “Canada and the UN,” amounting to 10.5 hours of course time. With regard to exercises, Unified Enforcer was the only DP4 exercise that simulated peacekeeping, though not a UN force but a Multinational Peace Support Force under a NATO-like alliance. Still, it was a PSO mission, deployed with the consent of conflicting parties under a peace agreement. The exercise ran from 2002 to 2007 under AMSP. In subsequent years, NSP ran Exercise Strategic Power, wherein students are asked to plan a Canadian contribution to a coalition mission similar to the 1999 NATO intervention in Kosovo. There, students can interact with consultants who provide advice about UN agencies/operations, but the students do not plan peacekeeping operations or role-play peacekeepers or UN commanders. In summary, from 2005 to 2015 the amount of CFC material covering PSOs and the UN has decreased to less than a quarter. To round off the professional development survey for officers, the highest level is DP5 for general and flag officers. There are almost no courses at this level since the traditional thinking has been that officers who reach this level already have considerable training and education, and can also teach themselves, mainly on the job. (This approach is currently being reconsidered.) The Executive Leaders Programme (ELP), held for one week annually at the Canadian Forces College, is one such course programme, and currently has no session on UN peace operations. The course is taught at a high strategic level. On the other end of the career and rank spectrum is the training of new recruits and non-commissioned members. Much of this is done in Saint-Jean. In addition to its cadet programme, Saint-Jean is home to the Chief Warrant Officer Osside Profession of Arms Institute which trains and educates future leaders of the Canadian Forces NCM corps. In this capacity, instructors and Faculty at Saint-Jean conduct an Intermediate Leadership Programme (ILP), Advanced Leadership Programme (ALP) for CPO2/MWO, the Senior Leadership Programme (SLP) for CPO1/CWO, and the Senior Appointment Programme qualification for specially selected Chief Petty Officers/Chief Warrant Officers. Currently, the largest number of NCMs receive their training through the ILP; this involves 10 weeks of distance learning and 3 weeks of residential learning, on issues that form the basis for almost all forms of military operations. As shown in Annex 5, in 2004-05, there were many teaching points relating to peacekeeping, including “The Suez Canal Crisis and the beginnings of peacekeeping (1956),” “The application of the Medak Accord in Croatia (1993),” “Rwanda: Operation Assurance (1996)” and points on “Canada’s military obligations within NATO and the UN.” Perhaps most relevant was a teaching point on “Identifying the types of peace support operations.” No similar points were found in the 2014/15 curriculum. In the more recent Intermediate Leadership Programme, the 25 Performance Objectives (POs) cover topics from Canadian Military History to Communication Strategies, but none are explicitly on PSOs or the United Nations. The closest is a PO on “Interact during operations with International Organizations (IOs), Non-Government Organizations (NGOs), Other Government Departments (OGDs) and the Host Nation.” We understand that specific teaching points of this PO are still being written. Similarly, no direct peacekeeping course-content was found for the senior course (SLP) for 2014/15. There were only two Enabling Objectives where peacekeeping might be mentioned: EO 5E2.01 (“Apply JIMP Doctrine within a Canadian Comprehensive Approach to Plans and Operations”) and 5E2.02 (“Sustain the Whole of Government Approach”). In conclusion, compared to 2004, there is a significant lack of PSO-specific teaching to future NCM leaders being done at Saint-Jean. There was no formalized or standardized training system for peace operations, despite almost 40 years of intensive Canadian participation in international peace operations. No comprehensive training policy, based on changing requirements, had been developed, and there was an absence of doctrine, standards, and performance evaluation mechanisms respecting the training of units deploying on peace operations …. The Somalia Inquiry urged that all Canadian Forces members receive PSO training from the PSTC. The Basic PSO course became the staple of the Centre for many years.18 However, after the Kandahar deployment in 2005-06, the PSTC changed its course offerings. The Basic course dropped from 88 percent of the training calendar to 45 percent.19 Rather than focusing on PSO, the PSTC diversified to meet the operational need, taking on a much wider array of tasks than its name suggested. The other courses the PSTC offers are on Information Operations, Individual Battle Task Standards (IBTS), Psychological Operations, and Civil Military Transition Team. There is also a somewhat PSO-related course in Civil-Military Cooperation (CIMIC). The CIMIC Operator Course for ranks of Lieutenant or higher (officers), Sgt. or higher (NCMs), can be quite useful for PSOs, though it is designed for a broader set of operations. The 13-day course is run four times a year for members who have been selected for CIMIC employment. The Centre also runs once a year a CIMIC Staff Officer Course for Captains or higher (warrant officer or higher for NCMs). Although interaction with other government agencies and non-governmental organizations (NGOs) is an inevitable part of every peacekeeping operation, the CIMIC courses do not directly include peacekeeping-specific training. A full list of courses is provided in Annex 6. We have found, however, that the PSTC provides much less than a quarter of peacekeeping training to its participants as compared to a decade ago. The Pearson Peacekeeping Centre (still often referred to as PPC even after being renamed the Pearson Centre) was originally created by the Canadian government as a peacekeeping training facility for officers and civilians from Canada and around the world. Headquartered in the former military facility of Canadian Forces Base Cornwallis in Nova Scotia, the PPC operated the Cornwallis facility from 1994 until 2012. (The full closure of the Pearson Centre occurred in November 2014.) Under the rubric of “the new peacekeeping partnership,” the PPC was the first international peacekeeping training centre to include integrated civilian and military peacekeeping training modules. At its height in the 1990s and early 2000s, Cornwallis hosted over a dozen courses per year, focusing on preparing civilians, police, and military personnel for deployment in UN peacekeeping operations. A list of course titles and exercises is provided in Annex 7. The PPC initially operated with core funding of about $4 million, provided equally by the Department of Foreign Affairs and International Trade (DFAIT) and the Department of National Defence (DND).25 DND also paid tuition fees for students and the salaries of personnel seconded to the PPC. It also paid tuition and travel fees for foreign military personnel attending PPC through Canada’s Military Training and Assistance Programme (MTAP). In the first decade, over half of the students were CAF officers. Approximately 150 Canadian Forces military personnel attended courses at PPC per year.26In 2006-07, there were 431 Canadian participants (military and civilian) in various PPC projects for the year (around 22% of the total participant population). The United Nations Integrated Mission Staff Office Course (UNIMSOC or C99) was held annually over six weeks at the PPC’s Cornwallis campus in Nova Scotia. After 2006, this course was supplemented by a three-week Senior Management Course (SMC) on UN Integrated Missions, aimed at teaching upper-level military officials about the planning, political and strategic aspects of peace missions. But by 2011 there were no Canadian Forces officers in the UNIMSOC and SMC courses. The vast majority of students come from Africa, with some from Latin America and South Asia. With the 2013 closure of the Pearson Centre and the loss of the Cornwallis facility, a unique resource for peacekeeping training, and an important educational and practical asset, was lost, leaving Canada with no facilities or institutions dedicated to the joint preparation of military, police and civilians for peacekeeping deployment. One of the major achievements of the PPC was to serve as a model for the establishment of other peacekeeping training centres. The PPC was a founder of the International Association of Peacekeeping Training Centres (IAPTC), which has grown to over 260 member organizations in over 30 countries.29 The first IAPTC meeting was held at the PPC. It is ironic that Canada’s pioneering institution is now defunct and no longer contributing to the IAPTC or the advancement of peacekeeping training and education at a time when cutting-edge thinking is still needed. Due to the decentralized manner in which members of the Canadian Armed Forces, commissioned and non-commissioned, are trained at the unit level, it is difficult to comprehensively assess the changes and trends in peacekeeping training for these troops over the last ten to fifteen years. Much anecdotal evidence, however, points to the lack of unit level training for peacekeeping. Additionally, because the majority of deployments of Canadian Forces in peace operations since 2002 have involved officer-level deployments on an individual basis, rather than formed units, this report has primarily focused on the dynamics of officer training, rather than NCMs. For specific trades, some UN-specific training has been carried out in the past. For instance, a two-week “United Nations Logistics Course” was held annually at the Canadian Forces School of Administration and Logistics in Borden, Ontario, but the course was discontinued in the mid-2000s. Until that point it proved particularly useful for logistics officers who were deployed to the UN’s mission on the Golan Heights, a contribution that Canada dropped in 2006 after 32 years. The decline in peacekeeping training provided by the Canadian Armed Forces is not limited to its own soldiers. The number of foreign nationals trained to serve in PSOs has declined as well. The loss of the Pearson Peacekeeping Centre had a major impact on training of international students. Also, the government cut the military assistance it provides to other countries in the form of training and education. The Department of National Defence established various military training programmes for foreign officers as part of a “defence diplomacy” initiative. These were under the Military Training Assistance Programme (MTAP) later renamed the Military Training and Cooperation Programme (MTCP) under the Directorate – Military Training & Cooperation (DMTC). These programmes have provided military training and education programmes to over 70 developing, non-NATO countries. PSO training is less controversial than combat training (given that combat training can more easily be misused), so much of the focus has been on PSO training. The programme conducts activities for foreign officers both inside Canada (mostly at the PSTC) and outside (through cooperation with host nations), improving the language capabilities of students, their professionalism and their capacity to undertake multilateral PSOs. In 2008-09, the MTAP annual budget was $22 million, with a significant focus on training for officers of the Afghan National Army rather than traditional peacekeeping training. Table 3 provides a snapshot (for Fiscal Year 2008/09) showing the nine CAF-sponsored courses with foreign military personnel training through the MTAP-MTCP program. With the end of NATO-led military operations in Afghanistan and a general reduction in defence spending, the budget was reduced to $15 million in 2015/16. Source: Summative Evaluation of the Contribution Agreement with MTAP, March 2009, 1258-117-3 (Chief of Review Services), p.11. Annex D.
A three-week Tactical Operations Staff Course (TOSC) ran for 22 series from 2005 to 2012 in peacekeeping training centres in countries like Kenya, Ghana and Mali. It graduated more than 500 students over seven years, and held exercises where foreign students role-played as UN peacekeepers in detailed and realistic simulations. Until 2013, there was also a Joint Command and Staff Course (JCSC) held in Aldershot, Nova Scotia, to prepare UN Member Nation officers for possible future staff positions in PKOs. Soon after the closure of the Pearson Peacekeeping Centre, however, the Aldershot school was closed due to a lack of funding. The Directorate of Military Training cooperation continues to hold the United Nations Staff Officer Course (UNSOC) and the United Nations Integrated Mission Staff Officer Course (UNIMSOC) annually, using training institutions in Africa and South America a venues for training officers from developing countries for peacekeeping deployment. The Canadian Defence Academy (CDA) organizes Senior Officer Seminars, about five per year for about 30 foreign officers per course. Each course is done with a foreign partner, such as Botswana, Brazil, Colombia, Indonesia and Serbia. In these seminars, PSOs and civil/military cooperation are often the theme. For instance, one seminar, funded by DMTC, was called the Senior Officer Peace Support Operations (SOPSO) Seminar, held in Rio de Janeiro, Brazil, in 2012. Ironically, given the cuts to Canadian-based peacekeeping training in recent years, Canada has been training more foreign officers in UN operations than it has its own officers. But even that has decreased due to a lack of funding. In addition to the lack of political support for PSOs under the Harper government, there were enduring myths in the CAF that held back the development of PSO training. #1. Peacekeeping missions are low-intensity, low-level operations. This myth stems primarily from the Cold War experience that peacekeeping missions mostly act as buffer zones between relatively stationary armies. Many therefore believe that, compared to NATO operations like the one in Afghanistan, UN peacekeeping operations are simple and easy. As described earlier in this report, however, the mandate and complexity of peace operations have evolved considerably since the end of the Cold War. To deal with the switch from interstate to intrastate conflict, modern operations became multi-dimensional, requiring highly trained and dedicated personnel who are intensely familiar not only with the specifics of their deployment, but also the operational mechanics that are unique to the United Nations, and to the limits of the Security Council mandate. The peacekeepers seek to meet very high post-war expectation under demanding circumstances. They must also be well prepared for combat, especially to repel attacks by spoilers of the peace process. As examples, the ongoing UN operations in the Democratic Republic of the Congo and in Mali are particularly complex and deadly. The mission in the Congo has a Security Council mandate for “offensive operations” against illegal armed groups, meaning that parts of the force are authorized to disarm such groups by force if necessary and neutralize them if need be. The peacekeepers in Mali, meanwhile, must take measures to prevent or mitigate deliberate attacks against themselves and the civilian population at considerable risk to themselves. Since its creation in 2013, the UN mission in Mali has suffered 44 combat fatalities, making it one of the most dangerous peacekeeping or peace enforcement missions. In order to be effectively deployed to these missions, peacekeepers must be specially trained in combat. They must also work alongside a wide array of different national forces from both the developed and the developing world, as well as with the diverse array of non-military peacekeepers for common protection and implementation of the mandate. These are not low-intensity operations requiring low skill levels. To be effective, the peacekeepers need to be well trained. #2. General combat training is sufficient to prepare troops for peacekeeping deployment. If the idea that peacekeeping is a low-intensity, “easy” deployment of armed forces is false, it is also untrue that soldiers trained for combat operations are sufficiently trained to be peacekeepers. The complex environments faced by UN peacekeepers demonstrate that the old notion that the best way to train a peacekeeper is to train a general-purpose, combat-capable soldier is no longer appropriate, if it ever was. While combat training remains essential for UN soldiers, much additional and specialized training is required. In Canada, the last fifteen years have seen a particular focus on training for NATO-style international interventions, given the CAF’s high-profile role in Afghanistan. However, modern peacekeeping missions involve fundamentally different dynamics facing personnel deployed on the ground, including a strong emphasis on negotiation and increased restrictions on the use of force. #3. Canada’s low level of engagement in peacekeeping operations has lessened the need for peacekeeping training in Canada. For decades Canada was recognized internationally as a leader in UN peacekeeping. It provided the largest number of troops during the Cold War and in the early 1990s it still held the number one spot (e.g., with some 3,300 troops in July 1993), operating in diverse locations such as Bosnia, Cambodia and Somalia. Figure 3 showed the number of Canadian uniformed personnel deployed from 1990 to the present. While the number of personnel deployed in the field by the United Nations is now at an all-time high (over 100,000 uniformed personnel), the Canadian Forces’ contribution is at an all-time low (with only 27 military personnel currently deployed). For some, this low level of engagement with United Nations peacekeeping justifies the cuts in training infrastructure that have been exhibited over the last decade. After all, what is the point of holding a large number of courses, exercises and simulations available to all CAF officers if fewer than 50 personnel will end up deploying to UN missions? This perspective, however, fundamentally misunderstands the purpose of military training, as well as the current political willingness to re-engage in PSOs. The aim of training regimes is not just to address the operational requirements of yesterday, but to ensure that military members are prepared for a wide range of possible operations that the Forces will be asked to engage with in the future. While the Harper government has, over the last 10 to 15 years, resisted significant contributions to UN peacekeeping operations, it is certain that under the Trudeau government, the Forces will be asked to send more personnel to peace operations. Indeed, the government’s 2015 Throne Speech states a plan to “renew Canada’s commitment to United Nations peacekeeping operations.”33By cutting its activities dedicated to peacekeeping to less than half, the CAF has significantly reduced its flexibility and preparedness in this domain and runs the risk of being less than able to follow the Government of Canada’s current and future directions. Indeed, the loss of CAF experience in the field since the early 2000s has carried a high price. The Canadian Forces, which once deployed in large numbers, now has little peacekeeping experience on which to base any contributions to UN PKOs (or international training). The methods, standards, numbers and doctrines of the United Nations have all evolved considerably over the past decade as the UN experienced the two surges (see Figure 2 but Canada has not kept up. The United States is putting renewed emphasis on UN peacekeeping and is urging countries from both the developed and developing worlds to contribute more. One New York Times headline highlighted an initiative of the Chairman of the Joint Chiefs of Staff: “Top American Commander Warns U.N. That Too Few Carry Efforts for Peace.”34 Furthermore, President Barack Obama led a Leaders’ Summit on Peacekeeping in New York on 28 September 2015 to shore up trained personnel and equipment contributions to meet the UN’s demanding mandates. Over a dozen nations pledged increased training, but the Harper government was absent from the summit altogether.35 Already some European countries are re-engaging in peacekeeping, such as France, The Netherlands and Sweden in the Mali mission. Like those countries, Canada has much to contribute, if it can properly prepare itself. Peacekeeping training entails much more than unarmed combat exercises, marksmanship, and obstacle courses; on the ground, the most important talent may be walking in the shoes of the native population.… The quality you need most in United Nations peacekeeping is empathy. Canada’s international reputation as a prolific and proficient peacekeeper has been in decline for over a decade, owing to the country’s disengagement with operations in the twenty-first century. Of parallel concern is the loss of training infrastructure, which also affects the country’s ability to re-engage with peacekeeping in the future. As the peacekeeping veterans from the 1990s retire, and as the courses and exercises that were developed to prepare officers for the unique challenges of peacekeeping deployment are cut, Canada’s future foreign policy options have narrowed. Recommendation 1: Revive selected peacekeeping courses and exercises that were abandoned. Many of the excellent courses and exercises are still relevant and could easily be revived at minimal cost. The expertise in peacekeeping training that has been painstakingly developed need not be lost. While peacekeeping has evolved, many of the principles and practices have remained the same and can be built upon. Recommendation 2: Develop new training materials and mechanisms. Modern peacekeepers face significantly more dangerous environments and challenging mandates than in the traditional peacekeeping that Canada led in the Cold War. New operations also have more advanced doctrine, tools and technologies to work with. New training materials are therefore needed, particularly for the robust peacekeeping of today. Recommendation 3: Develop a new peacekeeping training centre. The loss of the Pearson Peacekeeping Centre was a devastating setback to Canadian preparedness; its revival (under that name or another) would help put Canada back in the game, when other countries like the United States, Europe and many developing countries have surpassed Canada’s early lead. Canada should work with these countries and the International Association of Peacekeeping Training Centres, which was founded at the PPC in 1995, to make a solid contribution to international training. Some of the training tools and exercises developed in other countries could be integrated so that CAF members could benefit from the experience of other peacekeeping contributors and become more interoperable with them. Recommendation 4: Integrate preparation for peace operations into the institutional culture of the Canadian Forces. It is often said that Generals tend to fight the last war. To ensure that the Canadian Armed Forces are not training only for Afghanistan-style missions, a renewed culture of preparation needs to be cultivated, for UN operations as well as others. Indeed, modern peacekeeping training might have helped Canada understand the lessons of the US-led Afghanistan military mission. – Pre- and post-deployment resiliency training, including mitigation of Post-Traumatic Stress Disorder. Re-engaging in peace operations is not merely altruism, it is enlightened national interest. In its first Speech from the Throne, the Trudeau government made the commitment: “to contribute to greater peace throughout the world, the Government will renew Canada’s commitment to United Nations peacekeeping operations ….”39 More specifically in the Mandate letter to the Minister of National Defence, Prime Minister Trudeau asked the minister to “[lead] an international effort to improve and expand the training of military and civilian personnel deployed on peace operations.”40 This will necessitate improved training within Canada. This comparison between 2014/15 and other years includes both undergraduate and graduate courses, as listed and described in the RMC Calendars. It uses the RMC counting of credits: one term course receives one credit; and full-year (two-term) course receives two credits. It does not include the peacekeeping summer institutes that were co-sponsored by RMC in 2001, 2002 and 2004. (IOs)) Peacekeeping & Peacemaking A study of peacekeeping and peacemaking operations in the 20th century from the Boxer Intervention of 1900 to the present. Operations taken under the auspices of the League of Nations and the United Nations will be analyzed as well as those endeavors involving cooperation between alliance or coalition partners. Special attention will be paid to the roles and the missions undertaken by the Canadian Armed Forces in the post-1945 era. An Introduction to Issues in Peacekeeping and Peacemaking A survey of selected issues in the history of peacekeeping and peacemaking in the late 20th Century. The issues covered will include: the evolving theory of peacemaking, humanity and warfare, disarmament, war crime trials and international law, the United Nations, civil-military co-operation in peacekeeping, international alliances and peacemaking. Attention will be paid to Canadian military, diplomatic and civilian contributions to the development of peacekeeping. 1 credit; DL) Introduction to Peacekeeping This course is designed to introduce students to the wide range of activities referred to as peacekeeping. The history of peacekeeping is reviewed through a series of case studies to better understand the evolution of contemporary peace support operations. This course provides an analysis of the consequences of peacekeeping and the emerging trends in the field, including gender and peacekeeping, HIV/AIDS and peacekeeping, and the impact of non-state actors on peacekeeping. (1 credit; DL; exclusion HIE380) International Conflict Management This course introduces students to the evolution of international peacekeeping, and the theory of third party intervention as a mechanism for managing armed conflicts. Students are introduced to a range of activities from 19th Century imperial policing and small wars to League of Nations Mandates, peace observation, and the UN system. The practice of peacekeeping is reviewed through a series of case studies as a background for introducing students to contemporary peace support operations and the evolving nature of the mandates and requisite activities that make up international peacekeeping efforts. (Security & Defence Management & Policy / Master of Public Admin. ; 1 credit, DL) Managing and Resolving Violent Conflicts This course examines the causes and correlates of violent conflict, and applies this to the study of conflict resolution before, during and after armed and organised violence within and between states. The evolution of conflict resolution as a discipline from the 1950s to the present, and changingpatterns of violence in the 20th century highlight third party roles and coercive and collaborative strategies. These themes are then explored through three phases in the conflict cycle: prevalence, violence, and post-violence. Comparative case studies of prevention, management, and post- conflict reconstruction are drawn from post-Cold War conflicts. The course assumes knowledge of basic conflict analysis tools and vocabulary, and requires wide reading about contemporary conflicts. It is strongly recommended that DM565 Conflict Analysis and Management be taken before this course. (War Studies; 1 credit) (not offered 2014/15 but listed in calendar) Evolution and Theory of International Peacekeeping This course examines the evolution of international peacekeeping, and the theory of third party intervention as a mechanism for conflict management. The evolution of interventions is traced from 19th century imperial policing and small wars to League of Nations Mandates, peace observation, and the UN system. Conflict resolution theory has some impact on peacekeeping after 1956, and new forms of post-colonial peacekeeping and stabilization missions characterize the Cold War period. These are examined from an interdisciplinary perspective. (1 Credit, DL) Contemporary Peace and Stabilisation Operations This course considers peacekeeping and international stabilization operations since the 1980s, with a focus on operations mounted by the UN and regional organizations. The political, strategic and tactical dimensions of peacekeeping are considered, drawing on the academic disciplines of history, political science, and social psychology. The course reviews efforts to improve and reform the conduct of international peacekeeping in light of recent experience, and the normative biases of peace studies, conflict resolution, and strategic studies. (2 Credits) Peacekeeping & Peacemaking As previously indicated. DL through DCS) An Introduction to Issues in Peacekeeping and Peacemaking As previously indicated. (1 Credit; DL through DCS) Introduction to Peacekeeping As previously indicated. (1 Credit) Managing and Resolving Violent Conflicts As previously indicated. 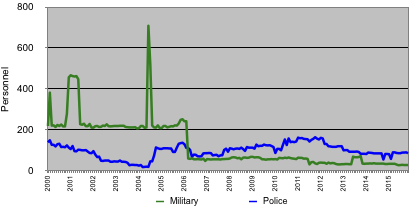 (1 Credit) Evolution and Theory of International Peacekeeping As previously indicated. (1 Credit) Contemporary Peace and Stabilisation Operations As previously indicated. DL) An Introduction to Issues in Peacekeeping and Peacemaking As previously indicated. (1 credit; DL) Introduction to Modern Peacekeeping A description was not provided in the calendar. Calendar refers to Division of Continuous Studies (DCS) for further information. From Course Notes Preface: POE 110 is a one-semester (15-week) course offered through the Division of Continuing Studies. The course provides an introduction to peacekeeping within the disciplines of conflict studies/management, international relations, history, and social psychology. It analyzes the study of conflict itself and surveys the UN system as a vehicle for managing conflict within and between states. It examines historical patterns in peacekeeping as a means to enhance diplomacy, suppress violence, reduce suffering, manage transitions, and impose order. Drawing on an interdisciplinary approach that involves social psychology, it also explores issues related to cross-cultural communication and conflict resolution in protracted social conflicts. The course is designed to prepare students for subsequent courses in conflict studies/management, international relations, history, and social psychology by introducing central concepts in each discipline, and illustrating how they are relevant to an interdisciplinary study of peacekeeping. Peacekeeping cases will be analyzed to facilitate an understanding of the evolution of peacekeeping and to examine lessons learned as they apply to modern peacekeeping. (2 credits) International Peacekeeping The course examines the evolution of international peacekeeping with an emphasis on the role of the United Nations and other multilateral organizations. The political, strategic and tactical dimensions of peacekeeping are covered. The course reviews efforts to improve and reform the conduct of international peacekeeping in light of recent experience. Lists PSO-related activities in the Joint Command and Staff Programme (JCSP) and its predecessors (Command and Staff Course or CSC) held at the CFC. On the Manghalour Peninsula, a strategically important petroleum exporter, Blueland, is attacked by combined Orangeland and Redland forces, which have quickly overrun the territories of Blueland. Working with advisors on military affairs, civil-military cooperation (CIMIC), and information ops, students play the role of commanding officers in planning and deploying a Chapter VII intervention from a NATO-like Alliance to restore the territorial sovereignty of Blueland. Students are tasked with forming two Combined Joint Task Force HQs. Utilizing the Allied Deployment and Movement Systems (ADAMS), a NATO strategic deployment planning system, students conduct the first four stages of the Canadian Force Operational Planning Process (CFOPP). They must generate a multinational force, develop Rules of Engagement (ROE) for the force, and plan for deployment and sustainment in this exercise, which is purely centred around military strategic considerations. This exercise was last run in 2004/2005 during CSC 31, and has not been carried over to the JCSP. One year after the Manghalour Peninsula Crisis (described in the Final Lance scenario above), Redland and Orangeland forces have been expelled from Blueland territory. The Alliance has handed over military operations to a UN Peace Implementation Force (UN-PIFA). Following the conflict, there have been reports of remaining tensions and incidents between ethnic groups in the region, as well as terrorist activities by insurgent groups. Course members are required to “play roles as staff officers of the CJTF (Combined Joint Task Force) HQ Joint Operations Planning Group,” with the goals of enforcing existing peace agreements and taking over responsibilities from the undermanned UN-PIFA in order to combat developing insurgent and humanitarian crises. Seven civilian experts interact with the students in this exercise to provide them with advice on PSOs. The expert consultants in the past were from the United Nations, the Canadian government, and NGOs. This exercise was last run in 2004/2005 during CSC 31, and has not been carried over to the CSP. Real-world Comparison: UN-authorized intervention against Iraq after the latter invaded Kuwait in 1990. On the island of Manitou, tensions increase between West-friendly Luseland and rival power Minburn, a former ally of the Soviet Union. With the ascendancy of an autocratic rule in Minburn, territorial disputes over oil and gas resources have escalated, resulting in the invasion of Luseland by Minburn. Following the invasion, the UN Security Council attempted to impose a ceasefire on the conflict and an embargo on Minburn, to little avail. With the Defence Forces of Luseland being overrun, the UNSC subsequently authorized an intervention that NATO takes up to restore the territorial integrity of Luseland. In the Zoran Sea region of Constellatia, an aggressor nation (Vulpecula) threatens its neighbours, particularly Auriga, which is also fighting a separatist group; WMD, criminal and terrorist threats exist in the oil-rich region. The UN Mission to Auriga (UNMA) and the UN Protection Force Auriga (UNSECFORA), already on the ground on Constellatia, are overwhelmed. In response the Security Council authorizes a NATO-like Alliance to restore peace and security in Auriga and to “protect and support UNMA in providing humanitarian assistance.” The Alliance seeks to deter any force that may oppose it. This exercise trains students to plan for asymmetric and conventional threats by requiring them to develop Rules of Engagement and manage the stages for the CAF Operational Planning Process for a mission of this type. The static scenario also allows students to consider humanitarian concerns of UN missions and how to collaborate with and help them by emphasizing the Operations Other Than War aspect of such a mission. The students complete a Mission Analysis and present various Intelligence and Information Briefs to a retired flag-officer on the situation in Constellatia. In some iterations of this Exercise, a number of staff and experts were brought into as international personnel (UNHRC, etc) to provide expert advice to students on the peace support side of the mission. Exercise Warrior Lance was last held in JCSP 39 in 2012/2013, and has not been continued in the last two programme years. In the region of Jardin Entremers, aggressor-state Zultar is engaged in a dispute with Panterria – the only country in the island region to have ties with the West – over border lines and offshore oil resources in the area. Despite a formal complaint by Panterria to the UN and a subsequent observer mission, Zultar continues its border violations and maritime aggression. The United Nations has asked the NATO-like Alliance to draw up plans for a potential incursion into Jardin Entremers to halt the escalation and restore the borders of Panterria. Jardin Entremers is held for 7 straight days. Students play the role of Alliance strategists, estimating the costs and requirements of an enforcement operation, visualizing the capabilities of Zultar’s forces and the battlespace, and run through the initial steps of the Canadian Forces Operational Planning Process (CFOPP). This Exercise continues to be held annually. 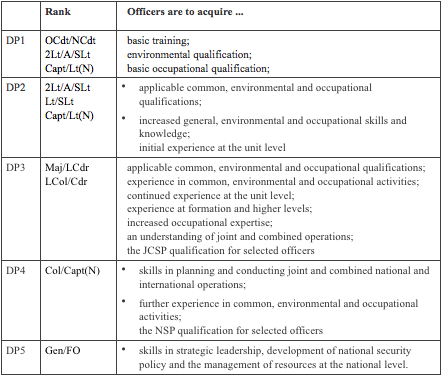 Lists PSO-related activities in the National Security Programme (NSP) and its predecessors (AMSP/AMSC, NSSC/NSSP). All NSP serials and predecessors included an Experiential Learning Visit (ELV, formerly called Field Study Exercise or FSE) title “US/UN” that included a 2-3 day visit to New York City, usually coming before a visit to Washington, DC. Though the Advanced Military Studies Course (AMSC) bridged the operational-strategic divide it is considered here as national security level. Note: Links only work within the CFC intranet. Note: the Advanced Military Studies Course held a 2-3 day module on Peace Support Operations. “Provides an opportunity to apply the concepts of campaigning within a complex joint, interagency, multinational, and public (JIMP) operating environment using design theory. In the Carnuba region, an aggressor state (Bardon) attacks a neutral country (Mandara). Coalition Forces under a Chapter VII resolution are charged with the following objectives: defeat Bardonese forces and reduce their military capabilities; prevent the supply of arms or other aid to Bardon; restore the boundaries of Mandara; and create an environment suitable for possible follow-on peace support and humanitarian missions. Students take on the role of members of the Interdepartmental Task Force to develop a strategic plan for Canada with regard to the unfolding crisis in Carnuba. In this exercise, students are not involved in planning of the actual coalition mission, but rather must work with relevant departments to “develop a national 3D&C (Diplomacy, Defence, Development & Commerce)” plan for potential future Canadian involvement in the coalition mission. The students must develop “Intent Briefings” for the three departments (DND/CF, DFAIT, and CIDA), a combined National Intent briefing, and a Letter to the Prime Minister. They are aided in this exercise by consultation with visiting policy executives from the relevant departments (3 from DFAIT, 5 from CIDA, and 4 from DND). This Exercise continues to be held on an annual basis. On the continent of Constellatia, the armed insurgency of ethnic Bataris in Auriga and Perseus has escalated, displacing 100,000 people, threatening to disintegrate the government of Auriga and destabilizing the region. If the situation deteriorates further, a UNSC resolution will be drafted authorizing an Alliance multinational force to stabilize the situation and allow UN officials – part of the pre-existing but overwhelmed UN Mission to Auriga (UNMA) and the UN Protection Force Auriga (UNSECFORA) – to address the growing humanitarian crisis. Students are required to develop a Strategic Assessment of the situation in Consellatia, resulting in a Strategic Campaign Design for the possibility of an armed intervention and campaign follow-up. Following consultations with subject matter experts on “issues of international peace and security, official development aid / international humanitarian aid and assistance, strategic communication, governance and diplomatic affairs,” students must establish a framework for regional stabilization and reconstruction to deal with the humanitarian and insurgency situation in the long term. Following that, students must develop a Letter of Understanding between the UN and Alliance on the intervention, leading to an Initiative Directive for the military and humanitarian intervention. This Exercise was last held in 2013/2014. Real-world Comparison: NATO’s International Security Assistance Force (ISAF) in Afghanistan, following the fall of the Taliban but before the counter-insurgency campaign began in earnest (2006–). Comments: six-day operational level exercise based on a PSO scenario. Part two of the Unified Command series occurs in the Zoran Sea region one year after an intervention operation developed by students during Exercise Unified Warrior. Following that major Alliance operation, the Batari Liberation Army (BLA) has been overrun, the Vulpeculan invasion reversed, and the borders and security of Auriga largely restored. However, instability remains after the conflict, and the Alliance has agreed to lead a follow-on operation in the form of a Multinational Peace Support Force (MNPSF), which will remain in Auriga for a number of years. In this exercise, students are asked to take on the role of planning strategists in the Multinational Peace Support Force that has been deployed in the year following Unified Warrior. Based on the scenario details they have been given, students must plan for the sustainable future of the PSO in the region, putting together a Mission Analysis, Information Brief, and Decision Brief to the ComMNPSF. The exercise’s primary aim “is to allow students, through mentor guidance, to focus on the spectrum of issues with which a commander must contend. The scenario involves multi-agency cooperation within the context of a stability and support operation.” Considerations for the operation include: ensuring that UN humanitarian aid flows freely; guarding against a resurgence of BLA remnants; preventing an environmental disaster in the region; addressing a cholera epidemic; and rebuilding infrastructure following the war. Subject-Matter Experts (SMEs) were brought in for each of the five years that this exercise was conducted, usually including staff with experience in the United National Development Programme, United Nations High Commissioner for Refugees, and other relevant organizations. This Exercise was last held in 2007/2008, and was not carried over into the NSP. Real-world Comparison: A higher-intensity version of United States and NATO action in Pakistan against Al-Qaeda forces. In the Zoran Sea region, tensions over oil resources and border disputes have mounted, particularly in the state of Auriga, a state which is friendly to the West but unable to maintain security and peace within its borders. The instability in the region centres primarily on the Batari Liberation Army (BLA), a terrorist group that has been attacking civilians and resources in Auriga, and which has the covert assistance of rival regional power Vulpecula. A terrorist attack on a civilian airliner happens as the personnel of the UN assistance mission in Auriga (UNAMA) and the UN security/protection force (UNSECFORA) are overwhelmed by the increasing violence in Auriga. The United Nations asks the NATO-like Alliance to put together a plan for a possible intervention to prevent the conflict from widening, restore peace, and protect foreign nationals in the region. In their role as Alliance strategists, students are required to conduct a Commander’s Estimate and Commander’s Course of Action (COA) for a potential future Alliance operation in the Zoran Sea, including the possibility of having to repulse a Vulpeculan invasion into Auriga. They are asked to integrate the available military and non-military capabilities, as described by the scenario, to put together a workable campaign plan that considers the region’s political dynamics, the existence of an insurgency in Auriga, the scope of the UN mandate, and the presence of UN missions and officials already on the ground. This Exercise was last held in 2007/2008, and was not carried over into the NSP. The Canadian Forces College educates and trains officers at the mid-career stage and later, covering DP3 (rank Major to Lieutenant Colonel) and DP4 (Colonel and newly promoted Brigadier General, as well as senior public servants). A review was made of CFC exercises and tutorials41 in the past decade or so to determine the extent of training relating to Peace Support Operations. Exercises at the CFC are generally focused on the operational planning process (OPP) before a mission is launched and rarely extend to the actual deployment of a force. They typically produce campaign plans with estimates, lines of operation, decision points, and possible courses of action. A higher-intensity version of United States and NATO action in Pakistan against Al-Qaeda forces. For the Intermediate Leadership Programme, this table shows the list of potentially relevant Performance Objectives (POs), Enabling Objectives (EOs), and Education Objectives (EdOs) in both 2004/05 and 2014/15. These were chosen because they were objectives that contained teaching points directly applicable to UN peacekeeping (bold). Source: PSTC materials (2012). Table developed with the assistance of Mohammed Masoodi. The PPC, later called the Pearson Centre, closed in 2013 so it no longer offers courses. Over the years it provided over 30 different courses to tens of thousands of Canadian military personnel, police and civilians, as well as thousands of internationals. 1 Prime Minister Justin Trudeau, “Minister of National Defence Mandate Letter,” undated [but issued in November 2015], available at pm.gc.ca/eng/minister-national-defence-mandate-letter. 2 Message commemorating the International Day of United Nations Peacekeepers, on 26 May 2006. Retrieved from http://www.un.org/en/events/peacekeepersday/2006/SG_message06.pdf. 3 In the traditional sense, peacekeeping is about providing security, including monitoring belligerents and interposing peacekeepers between them. 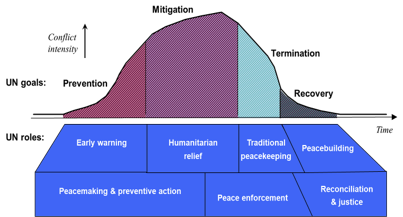 Note: the UN uses the term peacekeeping to cover the entire spectrum shown in Figure 1. In Canadian and NATO doctrine, the term “Peace Support Operations” is used, though the foreign ministry often uses the short form “peace operation.” In all these cases, the peacekeeping “trinity of principles” continues to apply: (1) consent for the deployment of the force by the major parties to the conflict, so the deployment cannot be considered an occupation; (2) impartiality, in that the force plays no favourites – as in police duty, where violations are spotted, reported and acted upon in an impartial fashion; and (3) minimum/defensive use of force to meet the objectives. Tactical offensive operations are used only in exceptional cases as part of Peace Enforcement. The violating parties are always given a chance to join or rejoin the peace process. 4 Department of National Defence, Peace Support Operations, Joint Doctrine Manual B-G J-005-307/ FP-030, 6 November 2002. 5 In some treatments, training is distinguished from education: through training, the military personnel must respond to similar (well-defined) situations in similar manner (quickly and in unison, requiring the military personnel to “think alike”). In education, the goal is complex problem-solving, where different approaches must be considered (“think differently but consistently”). Generally, “training” applies to military personnel at the non-commissioned member (NCM) level, whereas “education” applies to officer corps. But in modern peace operations, both are required. In the title of this report, for simplicity, training was used to encompass education as well. 6 The Security Council’s P5 contribute the following numbers of military personnel (as of 30 November 2015): China (2,870); France (902); UK (284); Russia (70); USA (40). These states all made pledges to increase their contributions at the Leaders’ Summit on Peacekeeping chaired by President Obama on 28 September 2015. Canada made no pledges at the summit. 7 The three temporary increases in Figure 3 are due to temporary contributions to the UN Mission in Ethiopia-Eritrea (UNMEE) and the UN stabilization mission in Haiti (MINUSTAH). The 2004 spike is from a re-hatting of Canadian soldiers who were part of the US-led intervention force in Haiti. They became blue berets for two months as they were withdrawing. Canada has not sent units to PKOs since these missions. Its contributions were only through individuals, mostly officers, with the exception of a single augmentation (six-month tour) to the Brazilian contingent in Haiti in 2014. 8 “Peace Support Operations,” B-G J-005-307/FP-030, November 2002. 9 United Nations, Department of Field Support and Department of Peacekeeping Operations, Training: A Strategic Investment in UN Peacekeeping, Global Peacekeeping Training Needs Assessment, Final Report, 2012-2013. 10 Prime Minister Justin Trudeau, “Minister of National Defence Mandate Letter,” undated [but issued in November 2015], available at pm.gc.ca/eng/minister-national-defence-mandate-letter. 12 As mentioned earlier, the separate training and education in these air force and navy are not included in this study because the activities are quite similar in peacekeeping as in other operations. The air force and navy officers deployed to leadership programmes in UN operations will need to get most of their training at the joint level. 13 AOC 33 (April–May, Sept–Dec 2015). Tut 1: Fighting power (wk 2) and then operations of various kinds: offensive (wk 3), defensive operations (wk 4), stability in COIN/PSO (wk 5), specific operations/ environments (wk 6) and Enabling Operations (Part 2). 14 Based on information from AOC 19, 2009, BDX 4. 15 The lecture-discussion is titled “Canada and Multilateral Engagement – UN” (NSP 8 (2015): N/DS571/ GEO/LD-1). 16 Royal Military College Saint-Jean, “Two-Year Academic Programmes (2014-2016),” available at http:// www.cmrsj-rmcsj.forces.gc.ca/ea-cs/gc-ct/gc-ct-eng.asp. 17 Commission of Inquiry into the Deployment of Canadian Forces to Somalia, Dishonoured Legacy: The Lessons of the Somalia Affair, Minister of Public Works and Government Services Canada, 1997. Volume 2, pp. 558 and 560. 18 Grant-Waddel, Trista. "Soldiers First": The Evolution of Training for Peacekeeping in the Canadian Forces, 1956-2000, May 2014. Accessed 23 September 2015, from http://ir.lib.uwo.ca/cgi/ viewcontent.cgi?article=3438&context=etd. 19 M.A. Rudderham, “Canada and United Nations Peace Operations: Challenges, opportunities, and Canada’s response,” International Journal, Vol. 63, No. 2 (Spring 2008), p. 381. 20 National Defence and the Canadian Armed Forces, “Training at the Peace Support Training Centre,” http://www.forces.gc.ca/en/training-establishments/peace-support-training.page?#ipt. 21 Michael Thompson, Courtney Hall and Barbara Adam, “Current Canadian Forces Education and Training for Moral and Ethical Decision Making in Operations,” 2009, Defence Research and Development Canada, DRDC No. CR 2009-043. Last accessed on September 22, 2015. 22 National Defence and the Canadian Armed Forces, “Training at the Peace Support Training Centre,” http://www.forces.gc.ca/en/training-establishments/peace-support-training.page?#ipt. 23 Emily Spencer and Tony Balasevicius, “Crucible of Success: Cultural Intelligence and the Modern Battlespace,” Canadian Military Journal, Vol. 9, No. 3 (2009), pg. 45. Accessed on September 9, 2015, at http://www.journal.forces.gc.ca/vo9/no3/doc/07-espencer-eng.pdf. 24 Commission of Inquiry into the Deployment of Canadian Forces to Somalia, Dishonoured Legacy: The Lessons of the Somalia Affair, Minister of Public Works and Government Services Canada, 1997. Volume 2, p. 628. 25 The total budget for the PPC varied from $10–15 million. Source: Pearson Peacekeeping Centre Annual Reports 2005-2011. 26 Interview by J. Libben with Dr. Ken Eyre on 30 August 2013. 27 Data from Annual Report 2006/09, Pearson Peacekeeping Centre. 28 Chief of Review Services, “Evaluation of the Pearson Peacekeeping Centre (PPC) Core Funding Contribution,” CRS 11258-154, April 2007 (Unclassified version is significantly redacted), available at http://www.crs.forces.gc.ca/reports-rapports/pdf/2007/P0761-eng.pdf. 29 See “IAPTC Membership,” at http://www.iaptc.org/iaptc-membership. 30 Major David Hill, “Finding the Right Balance of Stability to Combat Capability in the Canadian Army’s Training System,” Master of Defence Study (MDS) Major Research Paper, Canadian Forces College, 4 May 2014, available at http://www.cfc.forces.gc.ca/papers/csc/csc40/mds/Hill.pdf. 31 Alberto Cutillo, “Deploying the Best: Enhanced Training for United Nations Peacekeepers,” August 2013. 32 Department of Peacekeeping Operations, “Training: A Strategic Investment in UN Peacekeeping”. Global Peacekeeping Training Needs Assessment, Final Report 2012-2013. 33 Canada, Speech from the Throne, 4 December 2015, available at http://www.speech.gc.ca. 34 Rick Gladstone, “Top American Commander Warns U.N. That Too Few Carry Efforts for Peace,” New York Times, 28 July 2015. 35 The list of countries pledging increased training includes Australia, Brazil, China, Denmark, European Union, France, Germany, India, Indonesia, Italy, Netherlands, Japan, Turkey and the United States. Mexico pledged to open a new training centre. The full list of pledges can be found at http:// futurepeaceops.org/pksummit/. 36 Benton 85; Benton, Barbara, ed., Soldiers for Peace: Fifty Years of United Nations Peacekeeping, New York: American Historical Publications, 1996. 37 Commission of Inquiry into the Deployment of Canadian Forces to Somalia, Dishonoured Legacy: The Lessons of the Somalia Affair. Minister of Public Works and Government Services Canada, 1997. Volume 2, p. 560. 38 General Martin E. Dempsey, Chairman of the Joint Chiefs of Staff (New York; July 28, 2015) quoted by Erika Briceno, “4 Hints on What President Obama Will Say at the Leaders’ Summit on Peacekeeping,” 18 September 2015, available at http://unfoundationblog.org/4-hints-on-what-president-obama-will-say- at-the-un-peacekeeping-summit/. 39 Canada, Speech from the Throne, 4 December 2015, available at http://www.speech.gc.ca. 40 Prime Minister Justin Trudeau, “Minister of National Defence Mandate Letter,” undated [but issued in November 2015], available at pm.gc.ca/eng/minister-national-defence-mandate-letter. 41 Exercises are sometimes called tutorials for bureaucratic reasons internal to the College (resulting from the different departments that run the exercise).